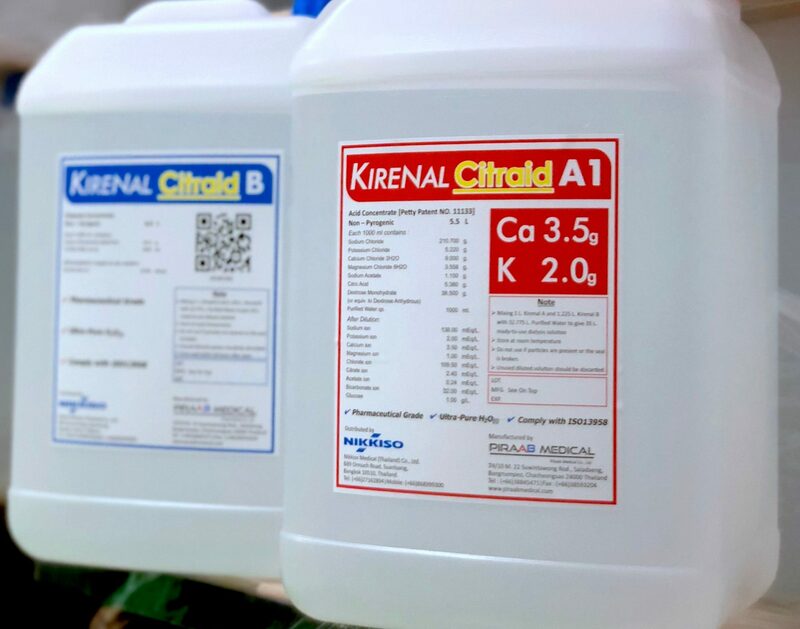 Nikkiso Medical (Thailand) Co., Ltd.
Kirenal Citraid™ is Piraab Medical’s latest innovation: The premium quality superior performing Citrate based hemodialysis acid concentrate. Citrate, a well-known antioxidant and anticoagulant, has novel properties including short half-life and systemic release by the human body benefitting dialysis patients with reduced inflammation, lower risks of bleeding, cardiovascular diseases and hypotension, and increased energy levels. In addition, operators and professionals will now have higher quality better performing dialysis concentrates. Citrate-infused concentrate reduces clotting rate of dialyzer and lower use of heparin. Furthermore, it is a safe biocompatible alternative to conventional dialysis concentrate.